“Katy” Railroad at Bartlett. Granted, farmers and residents along the line were so happy to have a railroad that when the last of the track was laid in Florence on December 27, 1911, an excursion train arrived loaded with 250 to 300 people who paid $1 for the round trip. They dressed in their Sunday best and enjoyed the daylong celebration. It was after The Bartlett-Western Railroad changed owners a couple of times and was sold in 1916 to Thomas Cronin that the route took on a new flair. Cronin had retired from a highly successful career with the International and Great Northern Railroad and was looking for a new challenge. He found it in the BW. Cronin began by turning the operation into a family affair naming his daughter Marie the vice-president, his daughter Ida became treasurer, Ida’s husband William Branagan served as general manager, and nephew Thomas Wolfe who had been injured in his former railroad position came along in a wheelchair and may have simply supervised. The entire clan moved into an apartment on the second floor of a brick commercial building next to the Katy Railroad and a few blocks from the Bartlett-Western depot. Marie and Ida Cronin grew up in the East Texas railroad town of Palestine, but both girls studied in Paris. Marie had remained in Paris until the beginning of World War I and earned an international reputation as a fine portraiture. Upon her return home, she won commissions for many of the portraits in the Texas State Capitol. Ida, a gifted singer-organist, studied music in Paris, retuned to Palestine, married William Branagan and became very active in Catholic women’s work. This rather unusual family set about developing a relationship with the 2,200 townspeople of Bartlett and soon found the community welcoming, if not a little surprised by their new neighbors. Despite derisive remarks, the BW in 1916 earned $3,817 in passenger revenue and $30,327 from freight. Cronin set about improving the BW service and maintenance of its equipment, bridges, and roadbed. At some point a tractor was fitted with flanged wheels, allowing it to pull flat cars loaded with up to 130 bales of cotton. 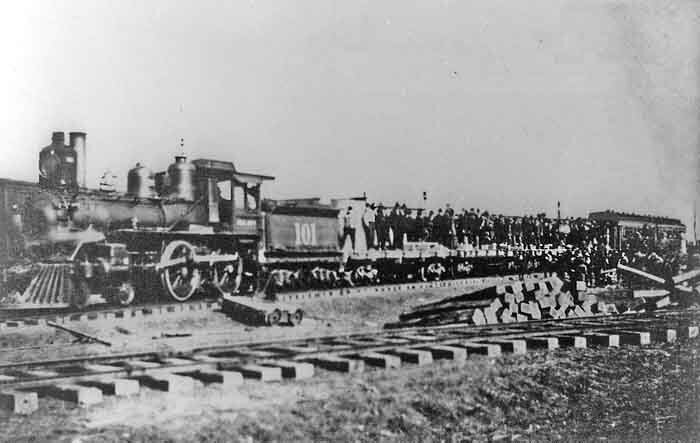 Crews carried sand to sprinkle on the tracks when the train, carrying a heavy load, had difficulty gaining traction on the up or down grade. When the BW secured the mail contract, it used Ford trucks equipped with railroad wheels to carry the mail. Although cotton was the largest commodity transported over the BW, it also carried the needs of the communities along its route including lignite, livestock, forest products, fruits, vegetables, drugs and, furniture. Cronin overhauled the trolley-style passenger car and tried, unsuccessfully, to get financing to extend the line to connect with the Santa Fe in Lampasas. Ironically, Ida Cronin Branagan fell in 1926 while getting off the BW and died from her injuries. That same year Thomas Cronin died, leaving Marie to serve as president of the BW while William Branagan continued as general manager. Marie, William, and cousin Thomas remained as a family living in the old commercial building. Marie Cronin relished her role as president of a railroad, even riding the BW to give attention to every detail. She appeared perfectly confident in herself and her abilities and showed more self-assurance than the people of Bartlett expected from a woman. One person said she “always dressed like she was going to meet the Queen.” Others said her strong voice dominated the room and she showed other eccentricities such as her long-time desire to be a lawyer. Despite never having studied the law, she took the bar exam many times without success. Many others found Marie friendly and generous to everyone without regard to race. One account claims she gave her Willys-Graham to her chauffer because he needed a car for his family. In the 1920s and 30s the BW struggled with damage from frequent flooding that tore out the tracks and continually drained the family’s savings. The boll weevil spread across Texas by 1926 causing cotton prices to drop from $1.59 to forty-five cents a bale, starting the downward spiral of revenue for the BW. Some family members have said Marie enjoyed being president of a railroad so much that she waited longer than reasonable to admit that the BW needed to be shut down. One nephew says Marie was what would be described today as a Type-A personality. The Texas Railroad Commission finally granted Marie Cronin’s request to close the BW on October 11, 1935. No one denies, however, that Marie Cronin and her family added color, charm, and a sense of excitement to life along the Bartlett-Western Railroad.